Have you chosen a bassinet for your newborn baby’s bedtime? Bassinets are great because they allow for easier co-sleeping — they’re also affordable, portable, and more snug for your little one than a large crib. However, they come with hazards, like any other sleeping method. As a unique sleeping solution for newborn babies, it’s important to become familiar with the safety rules when using a bassinet, to ensure the safest sleeping environment you can. That way baby gets to sleep, and you get peace of mind. Can I Use Fitted Sheets? Can I Use Softer Mattresses? Can I Use Bumper Pads? How Do You Keep Baby Safe? Bassinet safety is fairly simple. Most of the rules are logical and can be figured out with a little bit of common sense. It’s important to observe these rules as strictly as possible, to avoid hazards for your baby. Sudden Infant Death Syndrome — also known as SIDS — is what happens when a child passes away with no obvious cause before the age of 1. One of the things experts agree increases the chances of SIDS is unsafe sleeping practices. These 3 important bassinet sleeping safety rules are essential to the health of your baby. As lovely as an antique bassinet can be, chances are it doesn’t meet modern safety requirements. This means that yard sale treasure or family heirloom actually poses more risks to your baby than a newer model. Having a product that’s certified, and proven to be fit for use is the best way to ensure your baby sleeps safe and sound. If you want to use a hand-me-down bassinet, check the safety requirements yourself. You want to look out for mattresses that are too soft, overly puffy sides, overall stability, and more. You can find the full list of required safety features for bassinets and cribs here. Getting a bassinet from a trusted source is also another good way to ensure it’s safe. If it’s been certified to a certain standard by a reputable source, you’re more likely to be good-to-go. If you’re unsure about a certain brand or design, a little research online will go a long way. 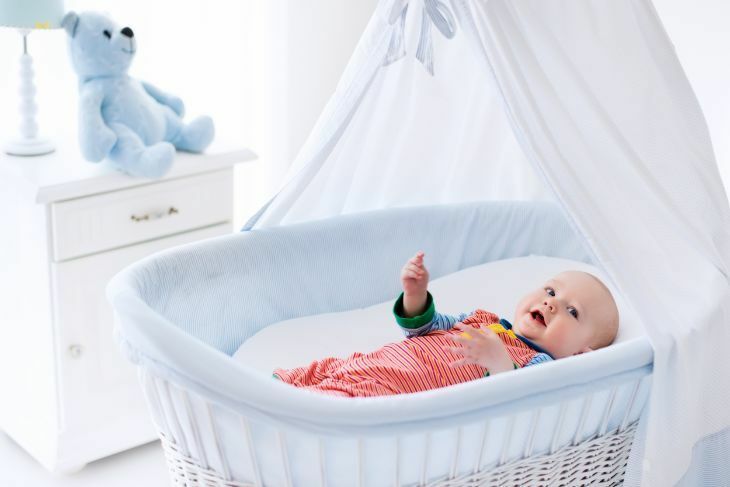 Mesh walls on a bassinet can literally save the life of your baby, because they offer more airflow. Think about what would happen if your baby somehow managed to roll over into the side of their bassinet. Which fabric would you prefer to be there? Breathable mesh to allow for airflow, or thick cloth? Mesh-walled bassinets also offer improved visual monitoring, making it much easier to keep an eye on baby. Fortunately, most modern bassinets feature mesh walls. If you happen to be considering one that doesn’t include this key safety feature, it’s time to reevaluate. Bassinets are portable, which is a major key selling point for them and something parents adore. However just because they can move doesn’t mean they always should. Unless your bassinet is designed to be a carrier, don’t attempt to move it around with your baby still inside. It’s also key for you to frequently check the wheels to ensure they’re locked when it’s stationary. Special care should be used at all times if your baby and the bassinet are by stairs, other children, or pets. Checking the wheels are locked is the best way to prevent a runaway disaster. In 2013, requirements for bassinets changed drastically after it was discovered that over 100 babies died in 6 years due to poor bassinet construction. These new requirements were implemented to improve the safety of bassinets and reduce the number of infant injuries and deaths caused by unsafe sleeping practices (source). Whenever an incident with a bassinet happens, an investigation is launched to look into the safety of that particular bassinet. If it fails to meet current standards, the product will be recalled. If you own a bassinet that has been recalled, you should get rid of it immediately. Return the product to the place you brought it from, with receipts if possible. Anytime you plan to make a purchase for your baby, check for recent recalls to make sure you haven’t come across a rogue product. Safe is better than sorry! Some parenting websites have emails you can sign up for to alert you whenever a baby product is recalled, ensuring your knowledge base is up-to-date at all times. Any extra objects placed in the crib or bassinet with your baby can pose a major risk of suffocation and choking. This includes toys, pillows, blankets, and even bottles. By eliminating extra items from the sleeper, you reduce the risk of SIDS drastically. It’s been reported that 70 percent infants who died from SIDS were sleeping with additional sleep aids like mattresses and blankets (source). If your baby is cold, you can get a thick, warm sleep sack and swaddle them inside. Swaddling is a great trick for encouraging healthy sleeping habits, just like pacifiers, so don’t be afraid to use these as often as needed! Fitted sheets are great for use in a bassinet, because they offer both comfort and cleanliness. The soft, smooth surface and removable sheet helps make accidents like a leaky diaper or spit up easier to clean, and could offer improved sleeping. If you’re using a fitted sheet, only use what comes with the bassinet you purchased, or fits its dimensions perfectly. Any extra fabric poses a risk — the sheet should be pulled taut and firm over the mattress. Purchasing extra fitted sheets is also recommended so you have one at all times, even during laundry days. Make a note of the exact size of your bassinet mattress so you can find fitted sheets that are a perfect fit for the most safe use. Parents are often a little surprised by the rigidity of bassinet mattresses and grow concerned for their baby’s comfort. This is when extra soft mattresses and plush pads start appearing in baby’s bed, and when tragedy is more likely to strike. Firm surfaces are best for your baby during those first few months of life. Soft surfaces may indent when the baby lays on them, and could cause suffocation or entrapment. If you’re worried that your baby isn’t comfortable enough, it’s key to remember newborns don’t need 4 pillows and a slew of blankets to get comfortable. As long as they feel warm and secure, they will be happy. They’re best left on a hard surface, laying flat on their back (source). Can My Baby Safely Sleep On Their Side? Just like mattresses, bumper pads are both unsafe and unnecessary in your baby’s sleeper. It was once was widely believed that thin bumper pads were a great addition to your baby’s crib — until studies showed they often resulted in SIDS. Most bassinets don’t need bumper pads anyway, since the walls are usually soft and breathable. A great thing about bassinets is the absence of slats and hard surfaces, which are the main reason bumper pads seem so appealing. If you’re using a bassinet, your baby is already as comfortable and safe as can be — no add-ons required. As your baby grows and moves to their own bed, you can then consider getting rails or bumpers to help prevent them from falling out of the bed. One of the drawbacks of bassinets is that they’re only intended for the first 4 to 6 months of your baby’s life. In fact, after a certain amount of time, a bassinet can become unsafe. Bottom line: you don’t want to wait too long to move your baby to a crib. Bassinets are typically very shallow, so once your baby learns to roll around and even stand, they’re no longer a safe option. The risk of injury with a bassinet increases as baby’s mobility does, so at the first sign of them being able to gain some mileage, it’s time to look into cribs (source). You’ll notice when your baby begins to move around. Keeping a close eye on them as they learn to move can help you decide when to introduce a crib. At the end of the day, any baby sleeper has risks and advantages — bassinets are no different. However, by ensuring you buy safety-certified bassinets, keep baby’s sleeping area free of clutter, and lock those wheels, you can make sure your baby is both safe and well-rested. Do you have any tips for baby’s safety in a bassinet? Leave your thoughts in the comments below! Or share this with another mother to spread bassinet safety awareness! What are the Best Baby Bassinets?